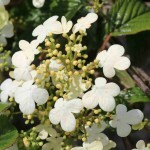 A compact, rounded shrub with horizontal branches and white, lace-cap like flowers starting in mid-spring, continuing into fall. Fall foliage is bronze red. 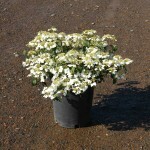 It prefers a site in full sun to part shade, in an average, well-drained soil. It performs better with reliable summer moisture. Prune as needed after flowering. Introduced by the Canadian Ornamental Plant Foundation.